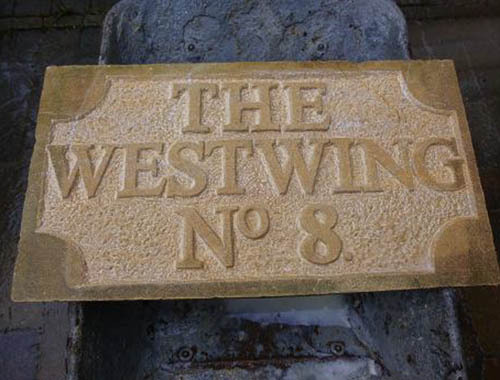 The West Wing, Manadon House ~ Plymouth. 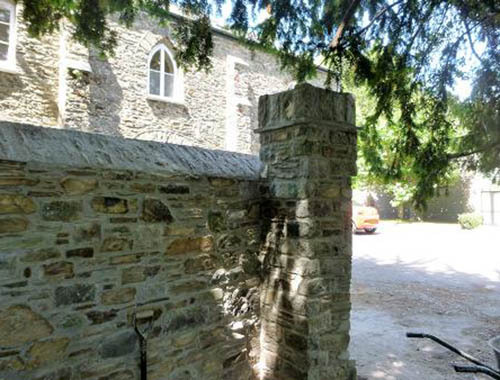 The present Grade II listed Manadon House was built as a country house in 1681 A.D. Having been re-modelled on a previous house here on the site, there are features within this building that date back even earlier to the 1500’s. In 1940 the R.N.E.C. (Royal Naval Engineering College) acquired the site and constructed new buildings to train their officers and in 1946 it was named H.M.S. Thunderer. 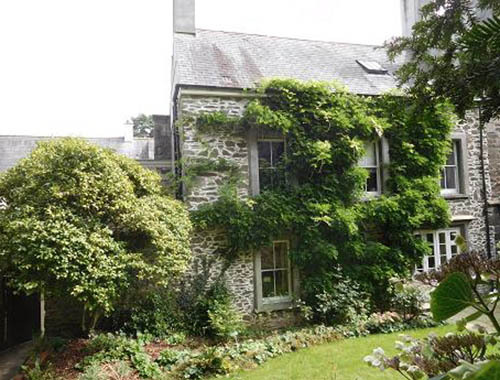 The house then became the home of the Admiral. The Navy left in 1995 and the grounds were sold off to create new housing. 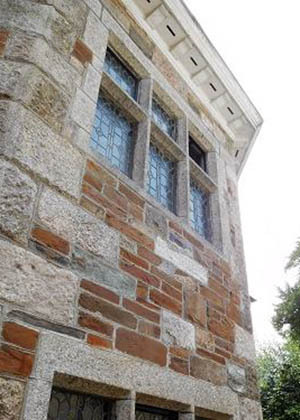 The Admirals house was sold to developers and converted into three separate dwellings. 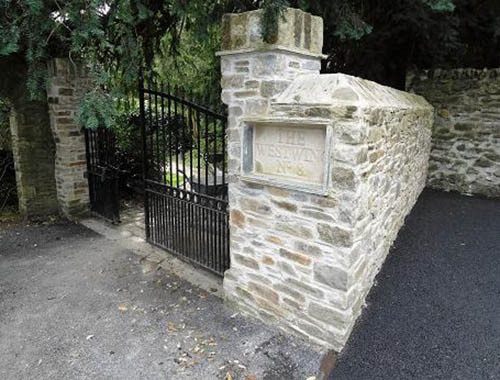 The owners of the West Wing at Manadon House had contacted us asking if we could create a new entrance into their property which consisted of new stone walls, gate pillars and an apron constructed in reclaimed granite. 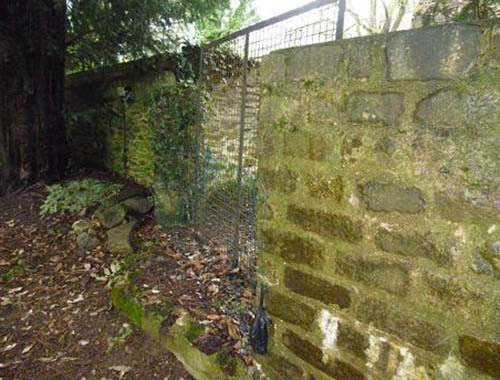 Being a Grade II listed property a listed planning application had to be approved by the council before work could commence. 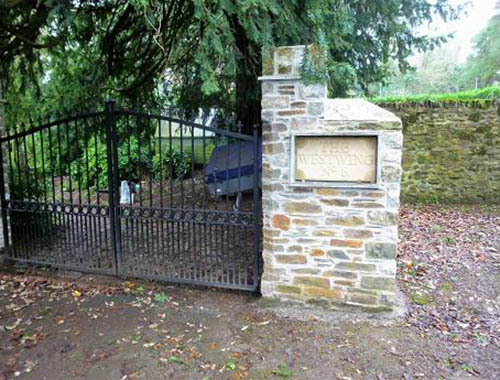 After this was approved our first day on site greeted us with a small stone pillar, a walk-through gate and some industrial wire cage fencing which formed their boundary. 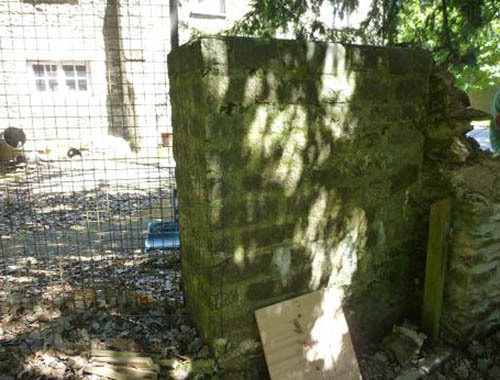 The existing stone pillar and wall was to be demolished, it wasn’t very old and had no historical value and was probably built sometime in the 1980’s, but it did prove to be a valuable source of quoin stones for the new wall as most of it had been constructed using old granite setts. 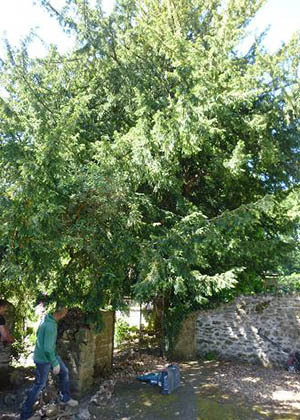 ‘Taxus baccata,’ commonly known as the English Yew. 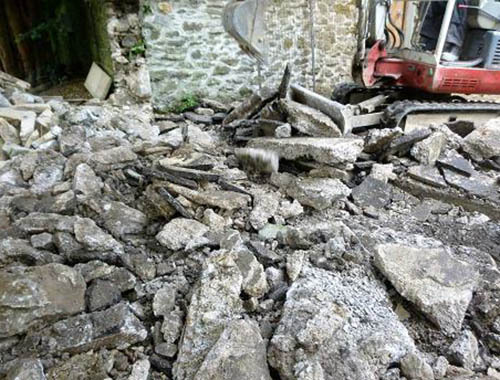 This was an issue we had to be aware of on site during the course of the work. 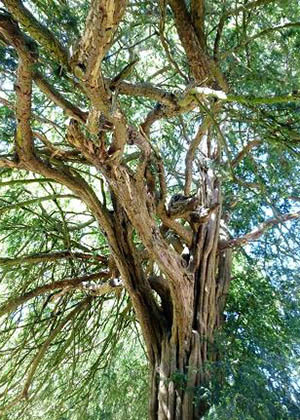 This lovely old Yew tree is thought to be at least 400 years old and if so is one of the oldest trees in Plymouth. 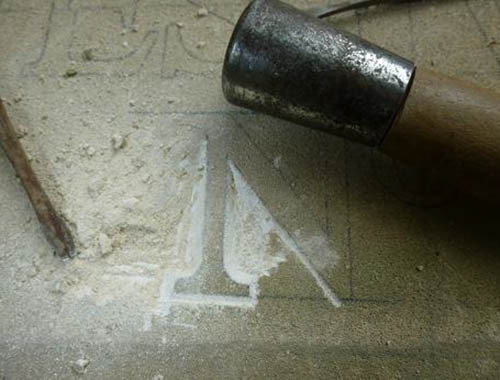 It has a conservation order assigned to it which means it is protected. Its location is situated right next to where we were going to construct the new wall. 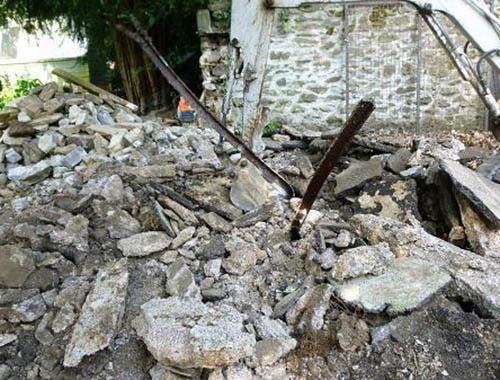 We had to be mindful of its roots whilst excavating the foundations for the wall. It’s interesting to note that one of the oldest surviving wooden objects ever found in the world was discovered in Essex, a spear head made from Yew and thought to be about 450,000 years old! 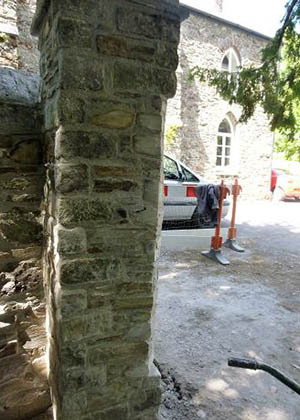 We soon got set up and proceeded to take down the existing stone pillar and set the stone aside for re-use. 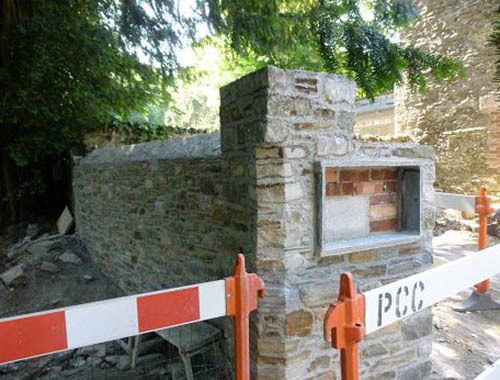 When the wall had been demolished we were confronted with a base consisting of tarmac and concrete which had been reinforced with steel girders. 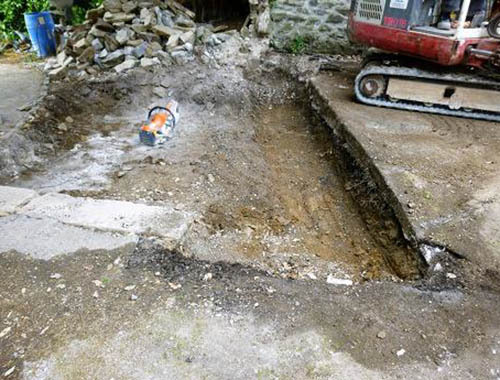 A small mini digger was brought in and used to take it all up and also excavate for the foundations and this was then removed from site. 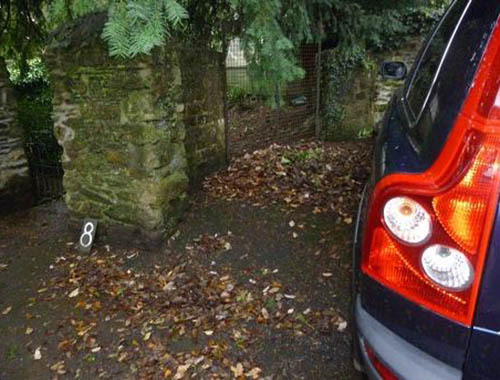 The excavated trench was inspected by the council to make sure the roots of the Yew tree had not been disturbed. And once they were happy with that we could carry on and lay the new foundation. We had also dug out a small trench across what was going to be the new opening for the entrance and laid in some reclaimed granite kerbs. 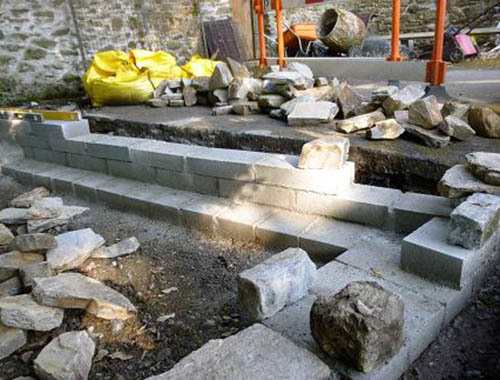 In the meantime a delivery of stone consisting of rustic slate had arrived and this was going to be used to build the new wall along with the stone we saved from the wall we had taken down earlier. 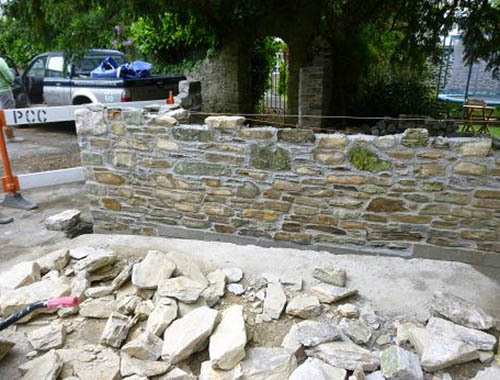 The new stone came from Yennadon Quarry, a small quarry situated in Dousland on the edge of Dartmoor. 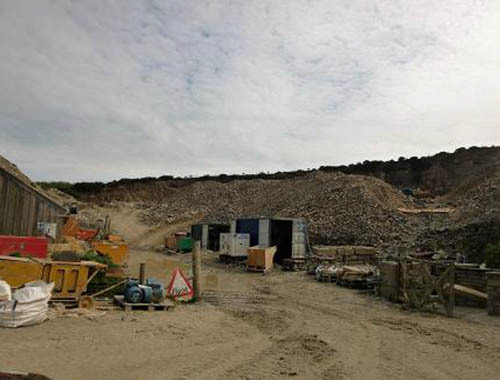 They have been quarrying stone here for more than a hundred years. 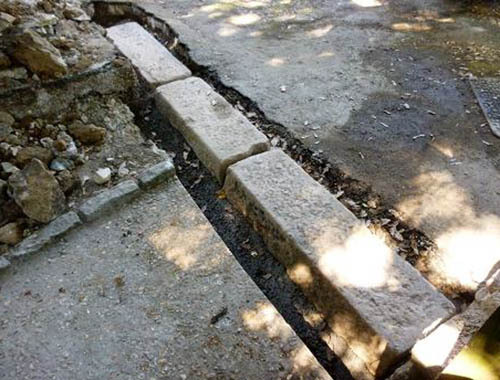 The wall was set out on the foundation to define the new boundary and everything below ground which would not be seen was constructed in concrete block. 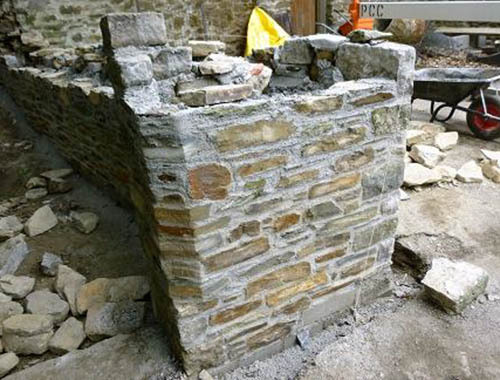 The next step was to start building the stonework. 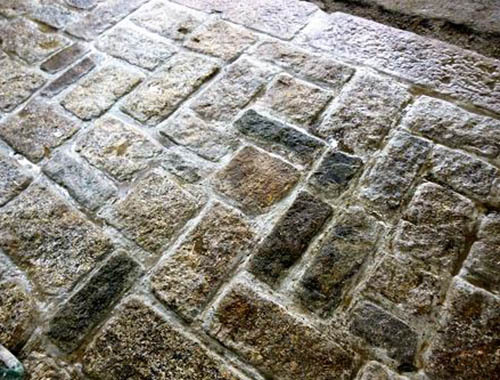 The old stone and the new matched in well together and the granite setts we put back made life a lot easier to build up all the quoins. 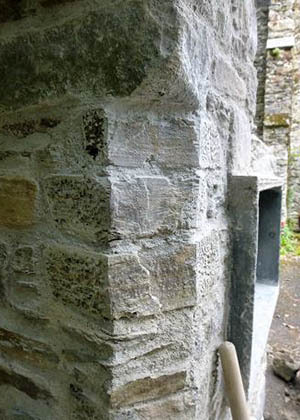 A traditional hydraulic lime mortar was used in the construction. 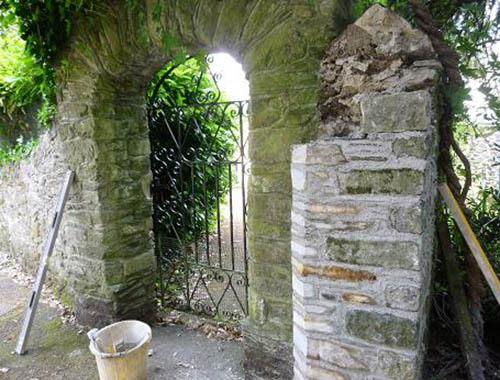 A section of wall had to be cut back and prepared in order for us to build a new pillar on the other side of the new opening so it could take the weight of a new gate which would eventually be fixed to it. 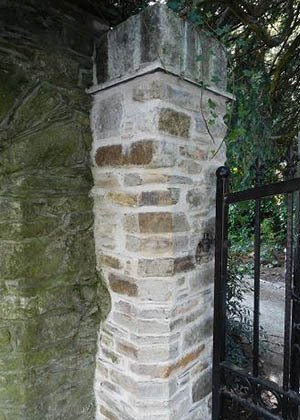 There is an arched opening next to it and this had splayed reveals and the new pillar we built replicated that detail. 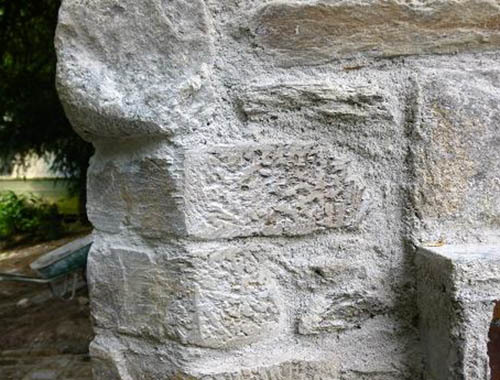 And that detail was also copied for the other pillar. 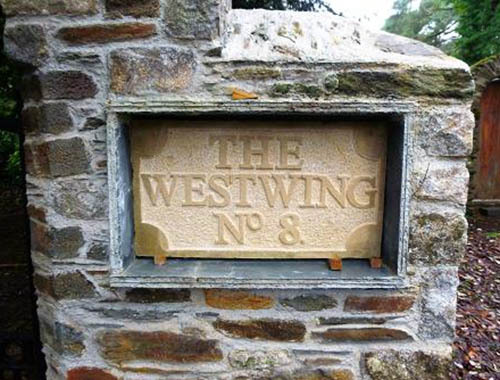 We also created a recessed panel to take a name plaque on the front of the wall. 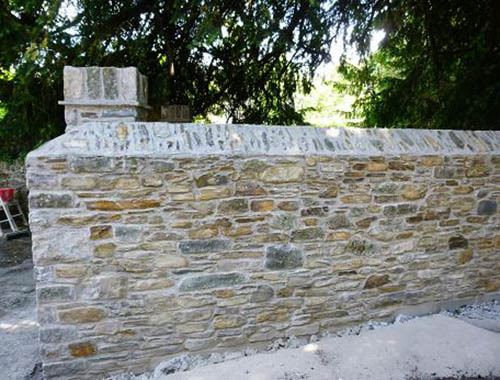 When the new wall was up to the required height the tops of the pillars were finished off using granite setts and the apex coping was completed. 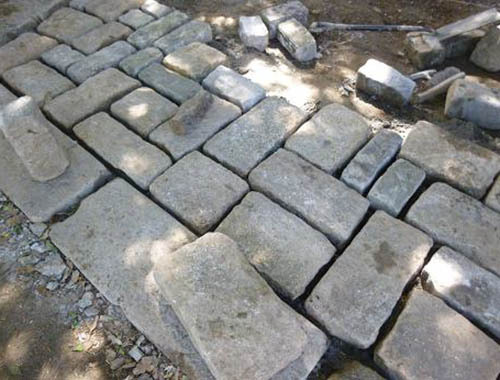 All the stone for the new splays were cut on site and dressed by hand. 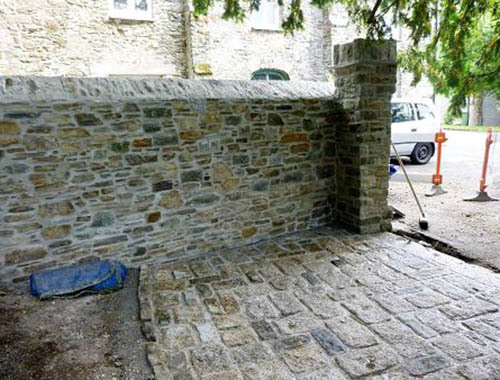 Our next job was to lay the granite setts for the apron. 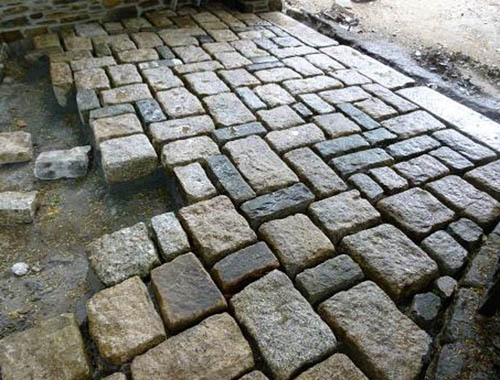 These setts were sourced locally and originally came from the Royal William Yard in Plymouth and are about 130 years old. 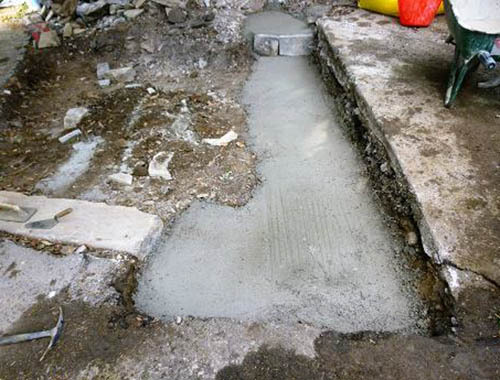 They were laid in a random pattern on a sand and cement screed but pointed with a lime mortar. 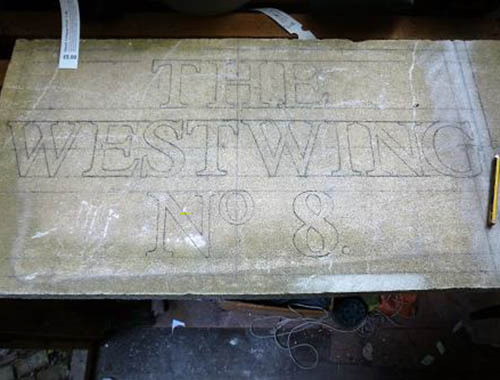 We had sourced a piece of Bathstone from a reclamation yard. 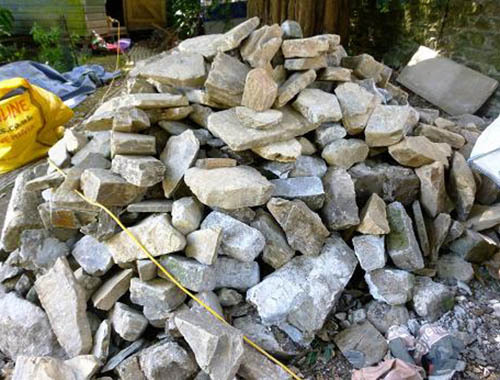 It was an off-cut of stone which was left over from work which had recently been carried out at Bath train station. 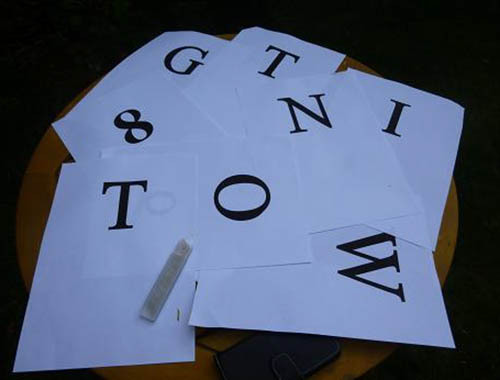 This was going to be used for the new name plaque. 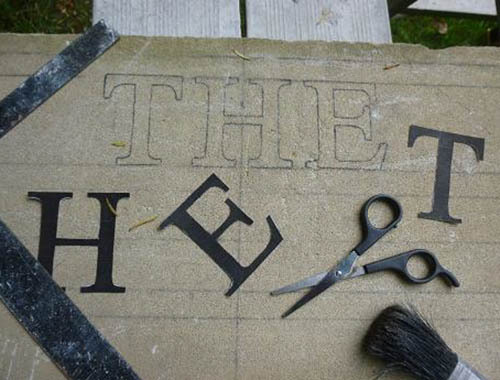 Letters were produced on a computer, cut out and then used as templates for the new lettering on the plaque. 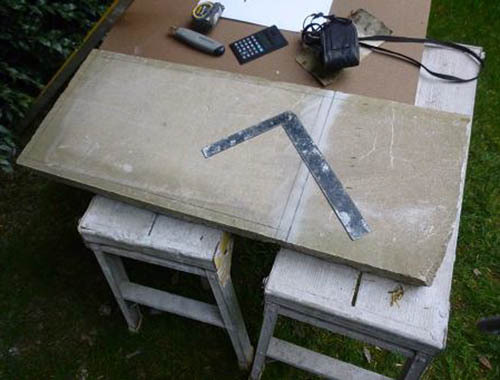 This was then transferred onto the stone in preparation for cutting. 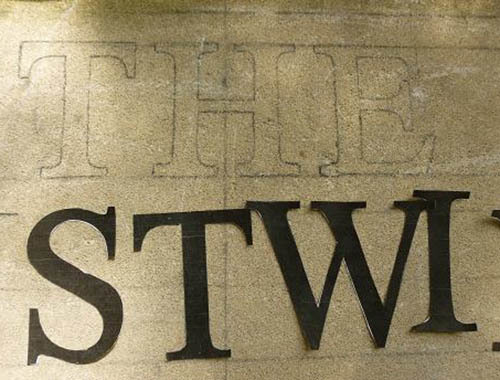 The lettering was cut in ‘Bas-relief’ style whereas the back ground is reduced to high-light the lettering. 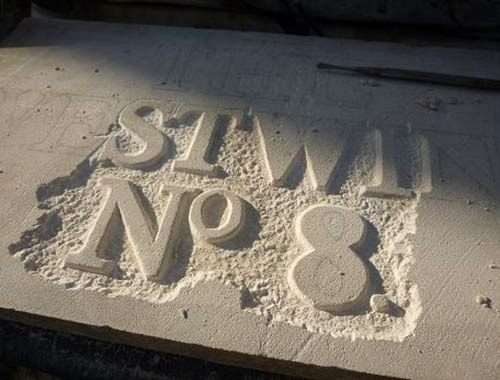 Bathstone is quite soft and easy to cut. 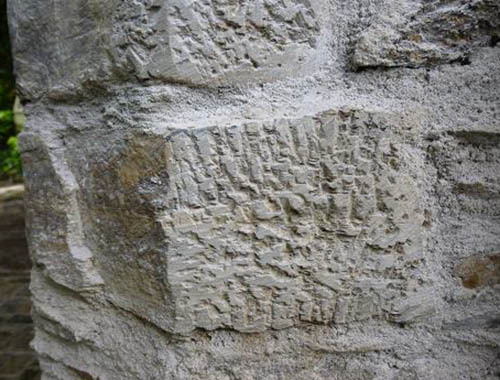 Fire sharp chisels were used for the job. 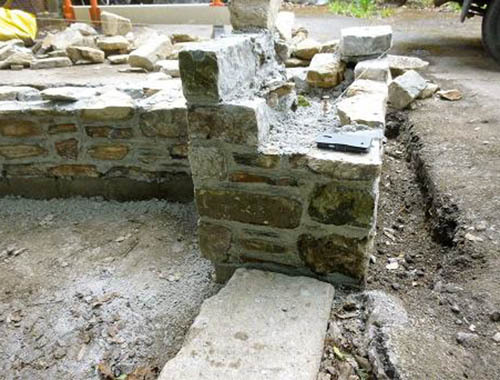 When completed this was then fixed into the recess we had formed in the new wall. 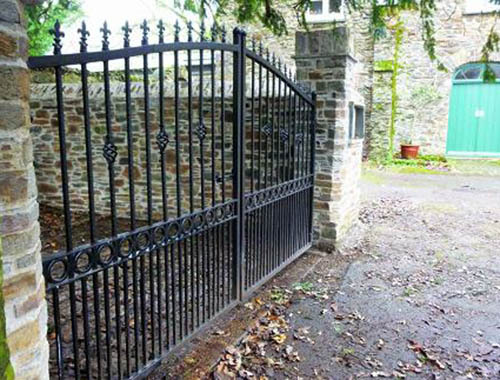 Finally new gates were designed and fixed to the pillars.